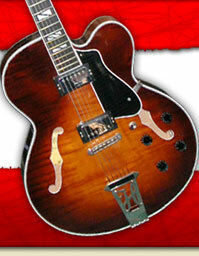 A real gem from the brief Fender/Guild DeArmond production era. Made in Korea in 1999, this is a RARE left handed M-75 Bluesbird reissue, no tremolo, in a great looking metallic blue. Original "reissue" DeArmond USA pickups sound amazing, articulation you can never get out of any Gibson type humbucker..IMHO. Solid 9/10 condition, no real signs of wear or damage. Plays like the proverbial dream. In the last 12 years, we have had one other of these through, in silver with the smaller pickups, so you may not see one of these again anytime soon!